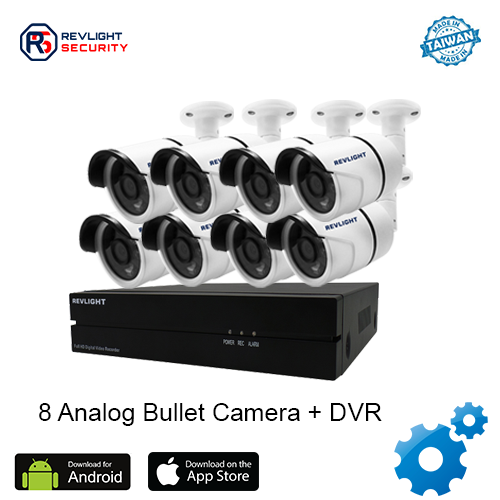 Our 8 Camera DVR Security System Consists of 8 analog camera including one 8 channel dvr system with 3 TB video recording storage, which has 1 year warranty. 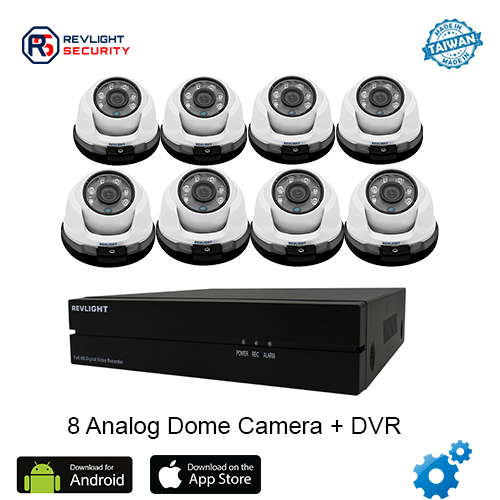 Save on Security, Install An 8 Camera DVR Security System. Protecting your home or business is not up for discussion. It can get pricy though. Having an 8 camera dvr security system is more affordable than you might think and a great solution for keeping your security at its best. You can even save on installation costs by doing it yourself. The easy mount ceiling/wall brackets and weatherproof housing can easily be installed indoors or out. Our analog cameras may be small, but they do their job well, giving you high quality pictures through the use of 1080 lines of resolution. Revlight Security offers some of the best HD CCTV Security cameras available today. Get High Quality Video Through Revlight Security’s HD CCTV Security Camera Systems. Experience top quality, detail and coverage our cameras have to offer. Keep your security affordable while experience reliability 24/7.Have questions for us? Call our Revlight Security CCTV Team experts today for a free consultation at +65 6678-6557.